Sony to give you free 4K films when you buy one of its Ultra HD TVs | What Hi-Fi? If the lack of 4K content has been the last remaining barrier to purchasing an Ultra HD TV now that prices have started coming down, Sony has announced details of a new offer designed to address that issue for you. 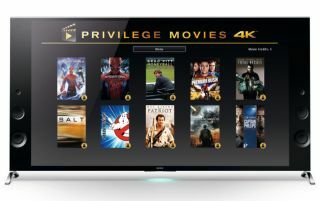 From now until Christmas, Sony will give you five free 4K movie titles when you buy selected 2014 Sony Bravia 4K Ultra HD TVs. And perhaps the best part is that you can choose your five films from a selection of 10. The 10 Hollywood blockbusters you can choose from are The Amazing Spider Man; The Amazing Spider Man 2; Moneyball; Premium Rush; Total Recall; Salt; Ghostbusters; The Patriot; Battle LA; and Captain Phillips. Your chosen films will come pre-loaded on a hard disc drive and can be claimed through the Sony website with proof of your TV purchase. However, you'll have to redeem your films before the end of January 2015. Sony also says: "Once redeemed Sony customers have until 30th September 2015 to unlock their 4K blockbusters and until 30th September 2016 to watch them."